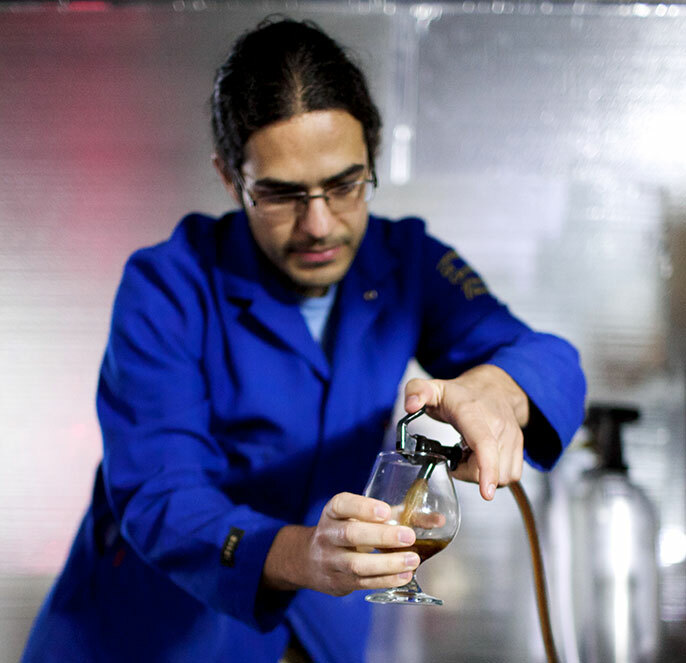 Graduate student Philip Vieira pours one of his beers at his brewery. For Philip Vieira, working on a Ph.D. in neuropsychology while starting a brewery has meant some sacrifices. There have been 5 a.m. lab sessions to collect data for his research on different regions of the brain and the formation of memory. There have been midnight sessions of transferring beer to kegs and midnight neuropsychology data analysis marathons. And there has been little time for long distance runs. The opening comes at a time of tremendous growth of breweries. In June, the Brewers Association announced there are more than 3,000 breweries operating in the United States, almost double the number compared to 2010. Seven Brethren is also part of another beer trend — the growth of brewery incubators. Brewery incubators allow multiple breweries to operate in the same location while sharing equipment, staffing and other costs. Vieira’s brewery is one of three that share a 1,800-square-foot industrial space, which serves as a tasting room and manufacturing facility. The three brewers are contract laborers under the company Brew Crew Inc., which leases the space and handles the business side of the operation. Vieira compared the arrangement to that of a musician and music label. This model allowed him to open a brewery without spending hundreds of thousands of dollars or having to get all the needed equipment, licenses and permits. After graduating from high school, Vieira spent three years traveling in Europe tracing his family roots, which includes a 16th century monastic brewer. He developed an interest in a variety of brewery traditions as he lived in the Czech Republic, Belgium, Germany and the United Kingdom. He returned to the United States, earned a bachelor’s degree from Fresno State and moved to Riverside for graduate school. The start of graduate school in 2009 coincided with Vieira beginning to brew beer at home. He teamed up with Z Riesz, a fellow graduate student at UC Riverside. They brewed in Vieira’s backyard using makeshift equipment from a WinCo grocery store and Home Depot. Then, as Vieira put it, “the inner scientist” in him wanted feedback. He started entering his beers in competitions. At first he got terrible results. But, the feedback was great. By 2012, he was winning awards and high praise at competitions throughout Southern California. Several of those highly praised beers pay tribute to the city of Riverside, whose symbol is the raincross, and UC Riverside, whose nickname is the Highlanders. The beers include: Raincross Red, an Irish red ale; Tartan Strong Ale, a Scottish strong ale; and Ryeside Ale, a Scottish-American rye ale. He also created several beers using ingredients foraged from the UC Riverside campus, including kumquats, grapefruit and oranges. In the future, he would like to use types of citrus found in UC Riverside’s citrus variety collection, which has more than 1,000 varieties. Vieira, who is writing his dissertation and expects to receive his Ph.D. this fall, tries to spend only one full day a week at the brewery, but increasingly that is becoming two or three days a week. “Brewing is a lot more fun than typing on a computer,” he said.